Sakura, I’m sure you already know, is cherry blossom, and maccha is special powdered green tea. 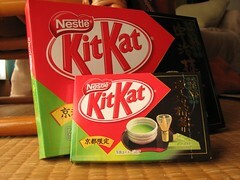 And I hate to be cynical, but seeing as Nestlé Japan are, I’ll play too. There’s such a thing as over-egging the cake. Gilding the lily. Mashing two national treasures together for no reason other than to shift product. 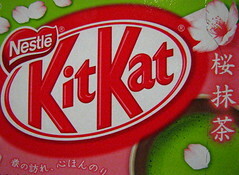 As we’ve seen before, Nestlé Japan like to bang that cherry blossom drum. And we haven’t been short of maccha editions either. And what you get when you put them both together is neither. It certainly tastes of both, but why? Like opera and freefall skydiving – you may love each individually, but I can’t think of a single reason to force them together. 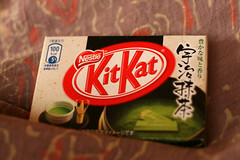 You’d’ve thought a good green tea KitKat would be the business, but it was a bad day for KitKats when we tested this one. Last of a bad group on a boiling hot day, and I was jonesing for some real chocolate by this stage, so it just didn’t hit the spot. Test conditions aside, it’s probably as good as past efforts. Presumably these single fingers are market testers, like the recent strawberry and blueberry cheesecake ones, to be followed later by more substantial packs. The Maccha (powdered green tea) Tiramisu is quite subtle and creamy, like a maccha latte. The Tiramisu has a rich coffee and cocoa aroma. Both are sublime, choosing a favourite will simply come down to whether you’re a tea or a coffee person. 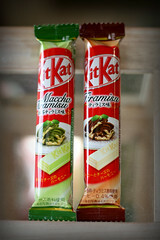 Green Tea flavour, in conjunction with, or maybe just advertising Itoh Kyuemon, the famous Kyoto tea and sweets shop. Another regional special omiyage edition from our special correspondent. 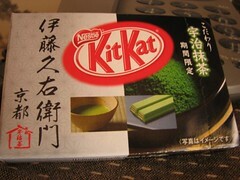 Unfortunately for me, these green tea KitKats proved immensely popular in our house, so they didn’t last long. You can’t go wrong with green tea though. A green tea all poshed up, along the lines of the exceedingly posh Brandy & Orange from April. Nice, and all that, but these editions are more expensive than the usual jobs. 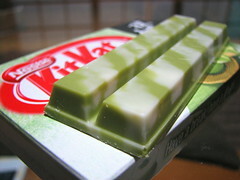 If the original green tea KitKat wasn’t delicious enough for you, here’s Maccha Milk. The milk not only gives it a cool, creamy texture, it also takes the edge off the green tea bitterness. I’ve been everywhere to find this. That gold stamp on the box roughly translates as “in frustratingly short supply”.